I’ve been craving more easy pieces in my wardrobe lately. I would just love a closet full of pieces that can be effortlessly thrown together into outfits in the morning. I try really hard not to live in running clothes day in and day out, but some days I only have about five seconds to get ready. It would be so nice to really only need those five seconds… because I love wearing everything in my closet and because so many things work well together. I started towards this goal a few months ago by de-cluttering and giving away a whole bunch of things I never wear anymore. Since then I’ve kept meaning to sit down with what’s left and see how it all fits with one of those wardrobe plans like the Vivienne Files Common Wardrobe or the Un-Fancy Capsule Wardrobe (Caroline of Un-Fancy learned how to sew, by the way – maybe we will be seeing Un-Fancy Handmade when she returns to blogging in several months?!). I have no intentions of going down to five items of clothing or anything, but I figured if I had a handful of things that I knew could mix and match easily, then I’d be prepared for those five second mornings. Maybe, just maybe, I won’t have to chase my little girl down the hallway in just my skivvies after she unpacks my sock drawer and runs down the hallway with as many socks as she can fit in her tiny little arms. Plus, it’s exciting thinking about how sewing a few fun new pieces that I was confident would mesh well with clusters of my clothes, like how most everything in the SWAP I did years ago worked (and still works!) well together. But, I haven’t made the time to create any such plans yet, so for my MSN make last month, I was flying by the seat of my pants towards what is still a very nebulous goal. And, I ended up making a t-shirt. But, hear me out – this top is not any old t-shirt. 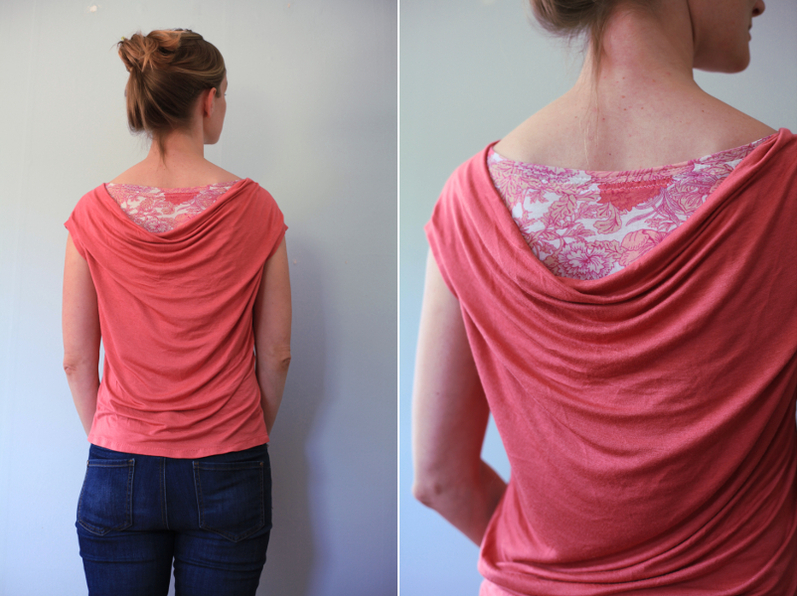 It’s the GrayDay Sandpoint Top, which pairs a wear-anywhere casual front with a fancy-drapey cowl back. I figured what could be easier than a top that would look just as good thrown on over jeans as worn with a cute skirt. This top is definitely one that requires little effort to pull an outfit together. 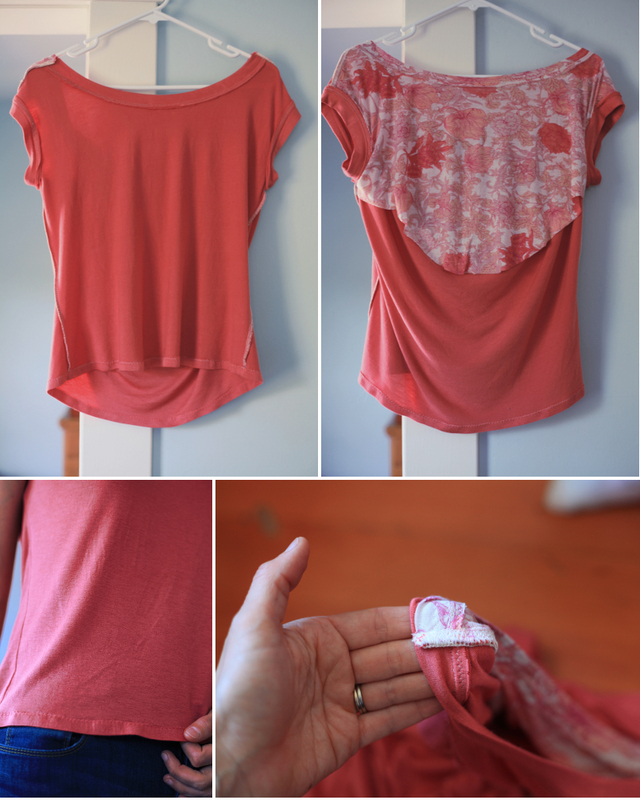 A fabric with the right drape is important for a top like this. After browsing Mood Fabric’s extensive collection of jerseys, I chose their stretch rayon jersey in coral reef. This fabric is super soft and has a subtle sheen to it that definitely helps dress it up and makes for a slinky top that feels great on. And, it comes in nearly 50 colors. I had a hard time choosing just one color, but for this one I chose “coral reef” because I wanted to pair it with a scrap I had left over of the floral silk-cotton jersey I used a few months back. Now I kind of want to get a few more colors for a few more of these tops! 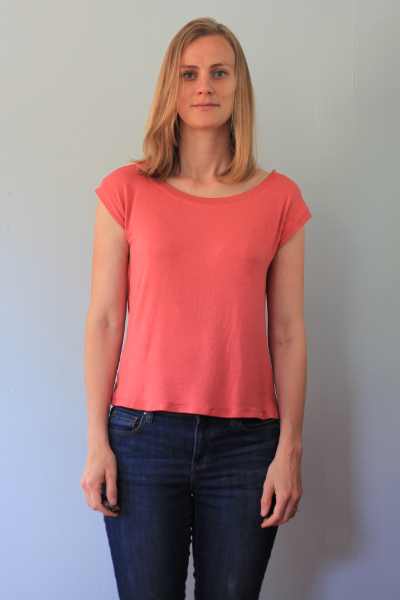 Typically, the Sandpoint Top requires a band that goes from one shoulder to the other across the back to help keep the shoulders and cowl in place. But, I was inspired by my sister-in-law, who has been wearing a lot of ready-to-wear tops with interesting cut outs in the back that reveal a contrasting fabric. I thought, why not just cut another piece out of a contrasting fabric to hold the back in place while adding a bit of fun? Speaking of hemming, I already wrote a bit about the trouble I had hemming this shirt. It was my own fault, having made the top much too long to begin with, but in the end – after cutting off three other hems! – I got a hem that I’m happy with. I ran into one small hiccup while sewing together the shoulders given the modification I made. I couldn’t figure out how to sew he three layers – front, inner back, and outer back cowl – together without first binding the necklines of the front and inner back pieces, which meant I wasn’t able to hide the shoulder seam in the neck binding like you might for most knit tops. I settled for trimming the seam allowance back a bit and making it as neat as possible, then top stitching it in place so it wouldn’t work its way out. Now, speaking of neck binding, I was really pleased with how the bindings turned out here. 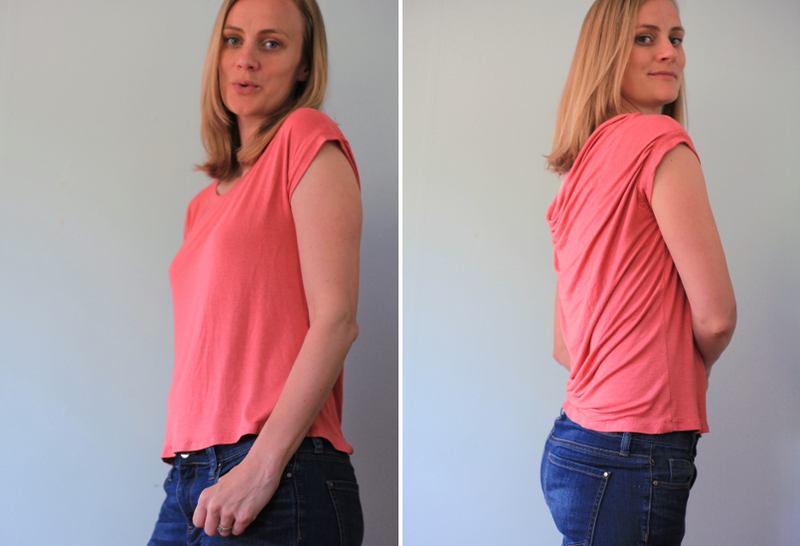 There were a few pointers in the instructions for the Sandpoint Top that I hadn’t been given before (and explain why I’ve gotten droopy necklines for my Drape Drape tops in the past), which helped everything came together very nicely here. Though the neckline is wide, it stays in place and hugs my body very nicely, even when I’m playing Mommy and chasing a sock-stealing toddler around the house. I cut the XS, took a half an inch in from both the center front and the center back, and added a bit of shaping to the side seams. Next time I plan to take the entire inch out of just the center front. I think the side seams could handle it, and it would bring in the neckline a bit while maintaining the intended fullness to the back cowl. My entire household seems to be big fans of this top. 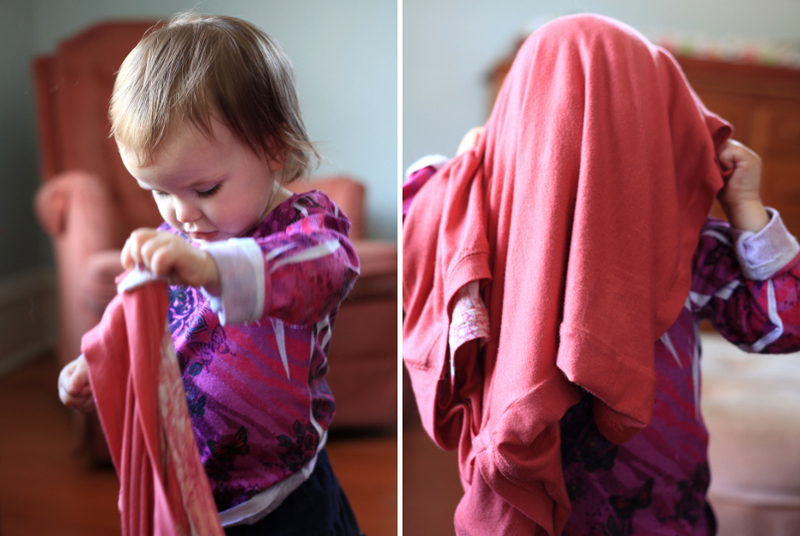 My husband kept complimenting the back drape, and my daughter kept trying to put it on while I was attempting to take detail shots for this post. So, I’d say it was a huge success! Maybe I could simplify my wardrobe plans even further by not worrying about a plan at all and instead just make this top in 50 different colors?! Haha! How are you feeling about your closet lately? Have you ever tried to plan out your wardrobe? This post can also be found on Mood Sewing Network. I used my MSN allowance towards the purchase of the fabric. Also, I received the pattern for free from Helena of Gray All Day back when she was looking for pattern testers. Sadly, I got hit with some crazy work things and missed her review deadline. 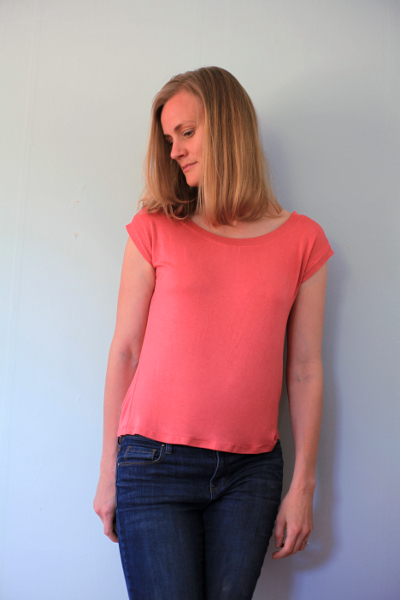 Then winter made it hard to want to sew a cute summery top. So, here it is now – many, many months later! Previous Post SA Curve Ruler: Review and Giveaway! Next Post SA Curve Ruler Discount! 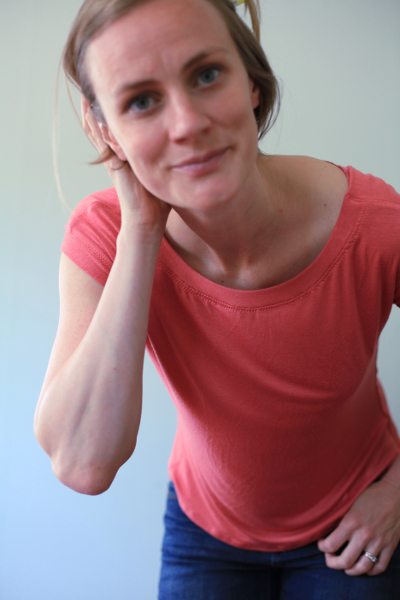 Love this top – and your little girl! That is a really pretty top. Can you wear it back to front? That might be an interesting look too. I haven’t tried it back to front! But, I bet you could since I’ve seen other people turn their Sandpoint Tops around. I’ll have to try it! If you do try it back to front and it looks good, I hope you’ll show us. The draping really does look great. And the peek-a-boo fabric you added to the back adds to the look a lot. It looks great on you. Thanks Melizza! I can’t wait to show it off to Helena at a future meet up! That’s right! She’s local. I totally forgot. That’s cool that she’ll get to see her design on you. Thanks! Also, your phrasing alerted me to the fact that I made a mullet top! Hahaha! Super cute top! I’m a fan of making separates, especially knit tops. They mix and match with so much, they get worn a lot, and they are comfy! I think whenever I get around to thinking about a coherent wardrobe, knit tops will definitely be a prominent feature! Love your top, especially your fun approach to the back. I’ve seen similar styles in RTW too…great idea! Thanks! My sister-in-law’s top all have the peek of contrast fabric at the bottom, but I really like it here at the top behind the cowl. So fun! I like your version of the top. I will have to try that next time I make a cowl neck. Your daughter is really really cute… I almost miss those days! Thanks! The backing behind the cowl was a fun way to help the neckline stay in place here. I love the coral fabric on you! In fact, I’m digging coral this season – several pieces in the stash and one made up. And yes – I enjoy a good de-clutter. Just did a big one for the same reasons as you. And as for easy pieces – what’s better than a tee. And the surprise back on yours is charming. I keep gravitating to coral, too! First the coral floral, and now this solid. It’s such a happy color and adds a nice bright pop! Love this top! Swiftly adding it to my pile of patterns! Great colour on you too! I definitely think this pattern is a hidden gem. I hope you enjoy making it up! Really cute top, and the back is a nice surprise!!! I’m adding more casual clothing to my wardrobe and summer dresses! Have you been told you resemble Piper from Orange is the New Black! No, I haven’t been told by anyone else that I resemble Piper! How fun! She’s so darling!! Of course your top looks fantastic, so easy to wear yet so cool. Suits you perfectly! That top is lovely – and you did a beautiful job on it! I particularly admire the contrast fabric inset in the back – that’s something that you will NEVER see in a store! And your daughter is terribly adorable – you can show pictures of her any time! Thanks for mentioning The Vivienne Files – I’m very grateful. Wow! Your Sandpoint looks great! I love the modifications you made, I might have to try that myself. I also am loving coral right now and I wish I had more of it. That mood fabric looks yummy! This color looks great on you! The style is very you- easy to wear, but elegant!